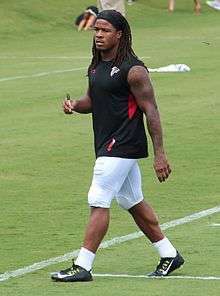 Devonta Freeman (born March 15, 1992) is an American football running back for the Atlanta Falcons of the National Football League (NFL). He was drafted by the Falcons in the fourth round of the 2014 NFL Draft. He played college football at Florida State. Considered a 4-star recruit by Rivals.com, he was rated the best running back in the nation. He committed to Florida State on June 24, 2010. As a junior in 2013, Freeman was a first-team All-Atlantic Coast Conference (ACC) selection and helped the Seminoles win the 2014 BCS National Championship Game. He rushed for over 1,000 yards on the ground, the first Nole to do so since Warrick Dunn in 1996. Freeman finished the season with career highs in rushing yards (1,016), receiving yards (278) and touchdowns (15) despite splitting carries with James Wilder, Jr. and Karlos Williams in Florida State's backfield. He led the Seminoles in rushing in each of his three seasons in Tallahassee. On January 11, 2014, he announced he would bypass his senior season and enter the 2014 NFL Draft. He was drafted by the Atlanta Falcons in the fourth round (103rd overall) of the 2014 NFL Draft. In his rookie season, Freeman shared touches with fellow backs Steven Jackson and Jacquizz Rogers and accumulated 248 rushing yards on 65 carries and 225 receiving yards on 30 receptions. He also recorded 1 receiving and 1 rushing touchdown in weeks 8 and 16 respectively. He chose to wear number 24 as a tribute to his late aunt, who was only 24 years old when she died of a heart attack. After recording just 43 rushing yards over the first two games, Freeman received his first career NFL start at RB on September 27, 2015 against the Dallas Cowboys, rushing for 141 yards and 3 touchdowns on 30 carries. The next week he rushed for 3 touchdowns again against the Houston Texans. In the following game, he rushed for a career-high 153 yards to start a three-game streak of 100 yard performances from week 4-7. In week 11, Freeman piled up 43 yards off three carries before leaving in the first half with a concussion. By the end of the season, Freeman totaled 1,634 all-purpose yards and 14 all-purpose touchdowns with 1,056 rushing yards (7th most in the season) and 11 rushing touchdowns, while also having 578 receiving yards and 3 receiving touchdowns. Following the season Freeman was selected to the Pro Bowl, the first of his career, and was named a Second-team All-Pro. Freeman was named one of the captains for the 2016 Pro Bowl. Freeman’s jersey number carries a special significance to him. He wears number 24 in honor of his late aunt Tamekia N. Brown, who tragically died at the age of 24 when Freeman was just 14 years old. He has her name tattooed on his left arm. Wikimedia Commons has media related to Devonta Freeman.